The death of a beloved pet for any reason can trigger sadness and grief that proves just as profound as that experienced after the loss of a family member or close friend. In some cases, people feel the void created by the death of their dog, cat, horse or any other furry, finned or feathered non-human companion even more acutely because we choose our pets and highly value their unquestioning, unconditional love. We offer suggestions to help you cope with the death of a beloved pet in a healthy, meaningful manner. It's easy to fall into the trap of dismissing the sadness and sorrow we feel after the death of a pet by telling ourselves, "Oh, it was just a dog... a cat..." etc., and measuring our grief against that we might feel/have felt after the death of a relative or friend. The reality, however, is that human beings love what they love, and no loss due to death should be viewed as any less significant, regardless of the deceased's species. Grief is grief and its effects can impact you just as profoundly—physically, emotionally and mentally—regardless of whether "Rex" was your father or your golden retriever. Therefore, you should not only acknowledge the reality of your feelings about the death of your pet but also accept your grief as a perfectly valid, normal and necessary response to loss. Your pet was a significant member of your household/family and attempting to diminish your feelings can lead to feelings of guilt, depression or other unhealthy effects caused by unresolved grief. One of the terrible realities caused by the forever-loss of someone or something we love is the void of emptiness it creates, both in our hearts and our homes, which often forces us to unwillingly confront our grief. For example, while you might have long taken for granted the unfailing, happy-to-see-you presence of your dog on the other side of your door whenever you returned home, his or her absence whenever you walk in afterward might affect you deeply and possibly trigger sadness and even tears. The death of a loved one creates a wound on our hearts and souls that only time can heal, but unlike the loss of a person, it's tempting to run out and find a "replacement pet," such as a new puppy or new kitten. You should resist the temptation to bring home a new pet right now merely to fill the emptiness in your heart and home. Animals, like people, possess unique personalities and no pet will ever replace your furry, finned or feathered non-human companion as if "nothing happened." Instead, allow yourself time to grieve the death of your pet until you know, in your heart, that you are ready to introduce a new pet into your home and to give him or her—and, more importantly, receive—the gift of unconditional love as you two form a new, unique relationship. U.S. Vice President Spiro Agnew famously described the incessant pessimism of journalists as the product of "nattering nabobs of negativism." Similarly, you might at some point encounter family members, friends, co-workers, or others who misguidedly suggest to you that you need to "get over your feelings," that "it's time to move on" following the death of your pet, or "You can always get another one." While probably well-intentioned, these phrases and others are among the worst things to say to someone grieving the death of a beloved pet. Regardless of conventional wisdom, grief neither follows a timetable nor does it adhere to predictable "stages." Thus, your feelings of sadness and sorrow following the death of your dog, cat, fish, snake, etc., will last as long as they last. Some "pet parents" adjust relatively quickly to pet loss while others take longer. The point is that your feelings concerning the death of your pet are unique and you need to respect your grief response regardless of what others suggest/tell you to do. As noted above, your pet was a significant member of your household/family during his or her lifetime. Thus, just as we honor and memorialize our human family members, friends, and others after they die, you should consider the meaningful rites, rituals and memorialization options available for pets today. 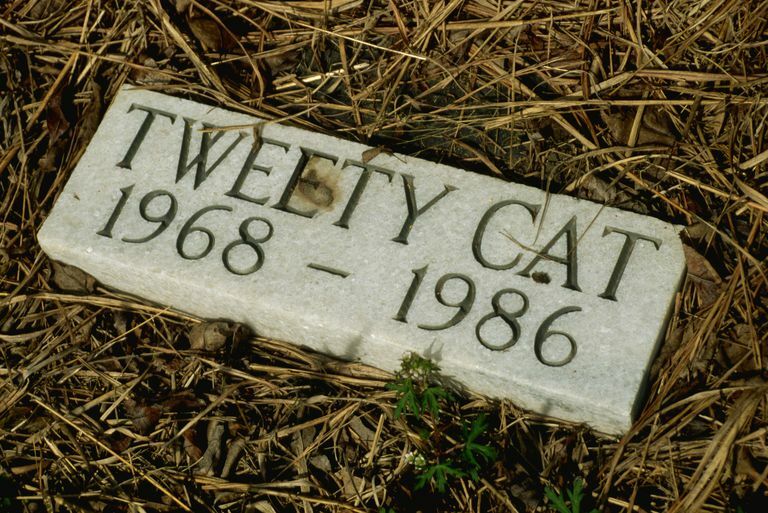 For instance, a growing number of pet-only cemeteries exist devoted to the internment of our beloved non-human companions, whether buried or cremated. Burial in such a cemetery, or placing your pet's "ashes" in a columbarium, can provide a fitting, honorable final resting place that reflects your pet's significance in your life and your enduring feelings after he or she dies. Likewise, you can select from many options to memorialize your beloved furry, finned or feathered non-human companion, including planting a tree or shrub on your property, designing a personalized urn or memorial decal, or even shooting your pet's cremated remains into the sky as fireworks during a service of your own design.